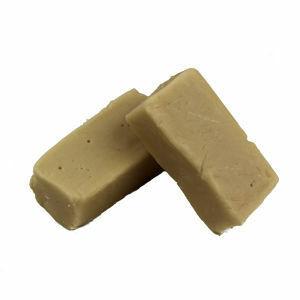 Home / Products / Candy / Creamy Fudge / Vanilla Fudge, 1 lb. Our vanilla fudge is fresh and creamy with a smooth, velvety taste. Sugar, Corn Syrup, Milk (with Dipotassium Phosphate, Carrageenan and Vitamin D3), Salted Butter (milk), Hydrogenated Palm Kernel Oil, Soy Lecithin (an emulsifier), Contains 1% or less of the following: Vanilla Extract, Potassium Sorbate (preservative), Salt and Tricalcium Phosphate- an anti caking agent. May contain Wheat, Milk, Peanuts, Tree Nuts, Soybeans and/or Eggs.